The Camera Store is Calgary's premier photographic retailer and is a full line dealer for the entire range of digital and conventional photographic equipment and supplies. They carry a wide range of brands including; Nikon, Canon, Leica, Hasselblad, Apple, Panasonic, Pentax and much more. 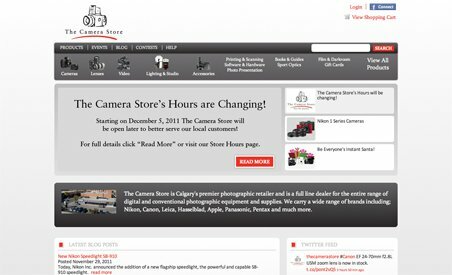 The Camera Store opened in 1996 to better serve photographers in the Calgary area. Now over 14 years later they're serving photographers all across Canada and the US online but are still 100% based in Calgary.